Work is well underway on the long-awaited upgrade of the A14 from Cambridge to Huntingdon. Transport Secretary Chris Grayling dug the first spadeful of earth back in November to mark the beginning of construction of the £1.5 billion scheme which will take around four years to complete and is one of Britain’s biggest road building projects. The upgrade, which will employ around 1,800 people, covers 22 miles, half of which is off the line of the present road. The central section will take four years to complete and work will also start near the A1 at Brampton which will take 18 months. This team will then move to the Histon area which will take around two years to complete. 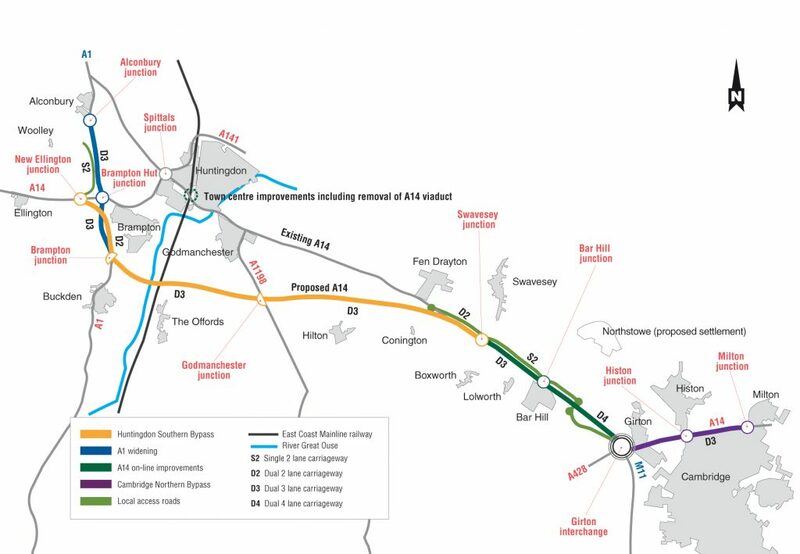 Once the main A14 is finished it will take a further year to complete construction on roads in the Huntingdon area, including the demolition of the A14 flyover.